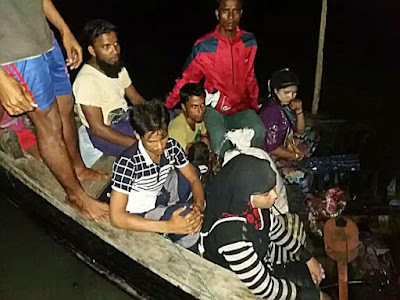 Dhaka and Cox's Bazar, Bangladesh -- The leader of Southeast Asia’s newest Muslim insurgent group struck a diplomatic tone as he expressed gratitude to Bangladesh for hosting Rohingya refugees and pledged not to harm the country’s honor and interest. But Ata Ullah (also known as Abu Ammar Jununi), chief of the Arakan Rohingya Salvation Army (ARSA), hammered Myanmar for allowing government forces to seal off villages and launch a crackdown against suspected militants in the Rakhine State. More than 75,000 Rohingya Muslims have fled from Myanmar to Bangladesh since October 2016 as a result of a military crackdown in Rakhine. As security officials ordered a lockdown and soldiers hunted for militants through torched villages, according to a United Nations report, terror-stricken refugees fled on foot, witnessing mass gang-rapes of women and killings of children. “The government of Bangladesh leads all the host countries who did not think twice in extending their helping hands to our destitute people in this very needy time,” said Ata Ullah, who emphasized ARSA was not affiliated with any foreign terror network. In the video, he spoke while seated amid a lush forest backdrop while guarded by four masked men clutching assault rifles. Ata Ullah and ARSA, which formerly called itself Harakah al-Yaqin (Arabic for “Faith Movement”), captured worldwide media exposure in December 2016 when the Brussels-based think tank International Crisis Group (ICG) issued a lengthy report about the new armed challenge faced by Myanmar. Ata Ullah, according to the ICG report, was born in Karachi, Pakistan, to a migrant father who fled religious persecution in his native Rakhine State. His family moved to Mecca, Saudi Arabia, where he was enrolled in an Islamic religious school. The report said Ata Ullah claimed to have left Saudi Arabia in 2012 shortly after serious ethnic clashes between Rohingya and ethnic Rakhine Buddhists erupted, killing more than 100 people. “Though not confirmed, there are indications he went to Pakistan, and possibly elsewhere, and that he received practical training in modern guerrilla warfare,” ICG said. Security analysts have not determined the exact number of ARSA’s forces and Burma has not officially acknowledged its existence. But BenarNews sources within the refugee camps confirm their existence. “There are more than 150 members of Myanmar’s separatist Rohingya groups in Ukhia-Teknaf areas, who go back and forth across the borders,” said a high-ranking source at a refugee camp who requested anonymity. A community leader at the Kutupalong refugee camp recently spoke to BenarNews and confirmed reports that ARSA supporters have been seen at camp for a few days. The source declined to say if they were armed. “But they do not do anything that might harm Bangladesh’s image,” the source said, referring to the insurgents. Kutupalong is one of the two government-run refugee camps in Cox’s Bazar. Its combined Rohingya population with the Nayapara Refugee Camp is about 30,000, officials said. Myanmar, a secluded country of almost 60 million people, sits in the corner of Southeast Asia between India and China. Bangladesh security officials expressed doubts on the presence of insurgents in the area, telling BenarNews security forces on high alert would have blocked free movement. State Minister for Foreign Affairs Md. Shahriar Alam said he was not aware of Ata Ullah’s video and Bangladesh has no ties with insurgent groups. Security analysts said ARSA is active in the jungles of the northern Rakhine State, where their presence could stoke religious tensions. They said ARSA’s emergence as an armed group signals a dangerous phase that could attract the attention of extremists in Pakistan and the Middle East. On Oct. 9, 2016, ARSA militants, who were then known as Harakah al-Yaqin, launched coordinated attacks on police posts and killed nine officers. They posted videos on YouTube claiming responsibility for the attacks. Myanmar responded by launching military operations that led to allegations of gang rapes and mass killings. On Aug. 14, Myanmar government ministers met 11 Buddhist monk leaders from the administrative capital Sittwe and discussed security issues in Rakhine, border affairs minister Lt. Gen. Ye Aung said. The meeting came four days after the Myanmar government dispatched hundreds of soldiers from an army battalion to Rakhine to increase security in the region. The military will use armored cars and helicopters in its operation against militants in northern Rakhine state, Ye Aung told reporters.